The Washington Post has a nice piece today about a former ESPN employee in training for the priesthood. 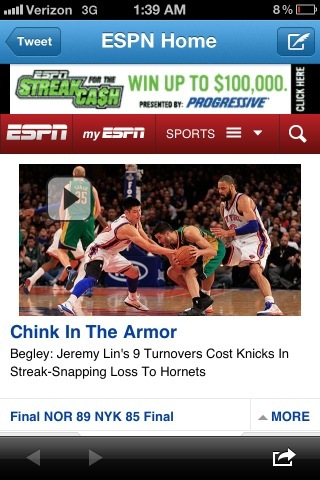 While Lin was making headlines, Federico, as a journalist at ESPN, was writing them. Federico read a column that night with a critical viewpoint on Lin, and he thoughtlessly penned the headline “Chink in the Armor.” Then the barrage of social media outrage started, and he saw what he had done. “I went to the bathroom and vomited,” he said at the time, describing the sickening realization that he had inadvertently made a racist pun that was now circling the world. What came next was predictable: As angry emails poured in from readers all over the world, Federico was fired from his dream job in sports media. What came after that, however, was not predictable at all. Five years past the night he thought had ruined his life, Federico is on the brink of becoming a Catholic priest. Now, he’s preaching the gospel of second chances. But it wasn’t racist for two reasons: “Chink” in the headline does not mean Asian, and if it was “thoughtless,” then it wasn’t racist, which would imply intent. Frederico fell victim to yet another moral panic because “social media”—which is code for leftists enforcing ideological orthodoxy—falsely claimed racist intent. It turned out OK for Frederico, but he never should have been fired. But at least the sports network’s ranks were spick and span afterward. Now, it just has to figure how to keep its predominantly white, conservative audience watching while being insulted by its leftist announcers.